Donic Newgy Robopong 1040 | OhGizmo! You might dominate the ping-pong table that’s set up in your parent’s basement, but if you have dreams of making it to the Olympic games some day, you’ll be facing some considerably more talented competition. But with a bit of practice (say, a few hundred thousand hours) you might just be ready to compete. Of course finding someone who shares your dream and dedication might not be easy, so thankfully we live in the 21st century where robots have at least reached the level where they can effectively serve you a ping-pong ball. The Donic Newgy Robopong 1040 is designed for the “advanced and ambitious” table tennis players and is not only able to put varying amounts of spin on the ball, but is also able to place shots all over the table thanks to a built-in oscillator. That allows a player to work on their footwork as well as paddle techniques. 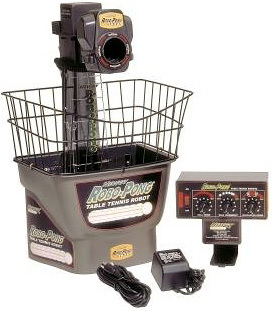 The ball basket has a 200 shot capacity, and there’s even an optional catch net accessory that will automatically return the balls to the basket after each shot. (Increasing the amount of time you’re playing, instead of hunting down missing ping-pong balls.) It’s available from Jarvis Sports for about $740, with the catch net accessory being an additional $530. Not sure where ohgizmop got there prices but I wouldn't want to shop there!!!!!!! !